A cast copper alloy harness fitting of late post-medieval or modern date (c. AD1600 - c. AD1900). Length 44mm, width 69.5mm and 5.0mm thick. Weight 37.43g. Often known as a 'breeching dee', this object is cast in one piece, is roughly A-shaped in plan and is comprises three distinct elements, a D-shaped loop, a central rectangular opening and a long bar. The curving part of the D-shaped element is sub-circular in cross-section and the remaining parts are rectangular in cross-section. The artefact is slightly worn but in a fair condition and has a well developed even mid-green patina overall. 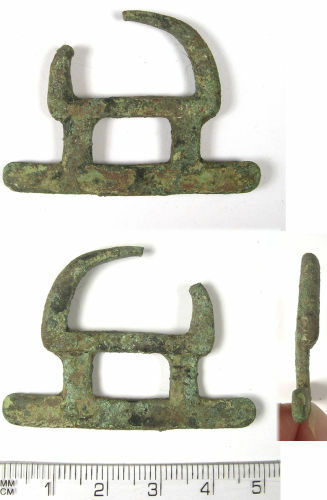 Similar buckles are recorded on the Portable Antiquities Scheme database. See finds: IOW-4D7715 from the Isle of Wight, NLM-1EE984 from Friesthorpe Parish, Lincolnshire and WMID-A07C58 from Shenstone Parish, Staffordshire.